Chess has remained a beloved activity in Armenia since Soviet times, and especially after Tigran Petrosian became world champion from 1963-1969. Karen Asrian was among those chess players who followed that tradition to become one of the most promising and short-lived names in independent Armenia. He was born in Yerevan on the day of the sixty-fifth anniversary of the Armenian Genocide: April 24, 1980. He started playing chess at the age of five and in 1990 he participated in the Leningrad (now St. Petersburg) classification tournament for the Youth World Chess Championship, where he completed his norm to be awarded the title of International Master at the age of nine. Interestingly, then champion Garry Kasparov (1985-1993) had completed the same norm at the age of thirteen and his predecessor Anatoli Karpov (1975-1985) was eleven when he did it. Asrian’s ELO rating (the measure to rank chess players) was 2310 in September 1996 and became 2600 at the end of 1998, when he became International Grandmaster. Between 1996 and 2008 he completed an impressive number of feats. In 1996 and 1997 he won the Tigran Petrosian Memorial international tournament (he would win it again in 2004) in Yerevan. Two years later, he won the Armenian Chess Championship and was champion of Europe with the Armenian team. Competing on the third board of the Armenian team, he won the bronze medal in the World Tournaments of 2001 and 2005, and the Chess Olympics of 2002 and 2004. He was also on the third board of the Armenian team that won the gold medal at the 37th Chess Olympiad in Turin (Italy) in 2006. During the same year, he had reached his highest ELO rating (2646), with put him on the 62nd position among chess players in the world. Meanwhile, Asrian had graduated from the Armenian State Institute of Physical Culture in 2001, when he also won the Sheikh Cup in Dubai. He won the Armenian Chess Championship again in 2007 and 2008, when he became the coach of the Iranian national chess team. His final rating, in April 2008, was 2630 (92nd in the world). In the early morning of June 9, 2008, Asrian felt ill while driving and pulled his car into a courtyard of Yerevan before losing consciousness. 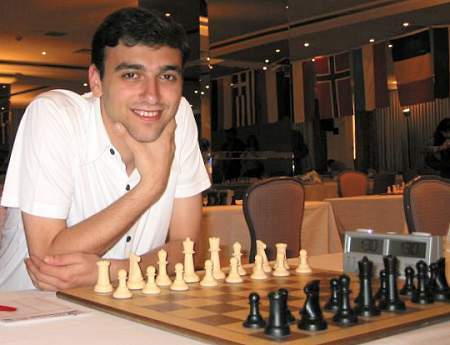 An ambulance crew pronounced him dead at the scene, and the Armenian Chess Federation reported that the player had died of a heart attack while driving. The Chess Giants Yerevan tournament, which was going to start that same day, was interrupted for a few days and then renamed Karen Asrian Memorial. The unfortunate player had an open casket funeral at the Yerevan Chess House on June 11, with the participation of the President of Armenia (and President of the Armenian Chess Federation) Serzh Sargsyan and top government and legislative officials. The Chess Giants Yerevan tournament was scheduled to start on June 9, with Asrian’s participation. It was postponed for a few days by decision of the Armenian Chess Federation and renamed the Karen Asrian Memorial. The tournament was held from June 12-15 and won by Levon Aronian, who had been on the first board of the gold medalist Armenian chess team in 2006.